Did you want to know how to become a yoga instructor in Bali? This beautiful island, known as the Island of the Gods, is steadily gaining popularity through the years, and not only through yoga. Once you’ve been there, you will understand why. Bali is a perfect combination of indescribably beautiful natural resources, great culture, and very friendly and warm people. It may sound cliché, but tourists have called this island-province a paradise. In fact, around 80% of foreign visitors to Indonesia go to Bali alone and nowhere else, making it the number one destination in Indonesia. What can you see and do in Bali? We have grouped the island’s top attractions to make it easier for you to decide what to do first. Bali is naturally best known for its beaches. The top tourist drawers are in the south, with Kuta and Seminyak. The facilities there are world-class, mainly targeting the rich tourists. There’s a lot of things to do there. If you’re a diver or if you want to be licensed, for example, best get it there. It’s much cheaper than in Australia. Snorkeling is also highly recommended, or beachcombing if you’re not up to spending a few dollars. For those after extreme water sports, Bali beaches offer jet skiing, sport fishing, water skiing, parasailing, and banana boat rides, among others. Surfing is also a big thing in Bali. Kuta and Seminyak are good for beginners, while those looking for a more challenging experience can go to Uluwatu and Balangan. There are others as well, including Sanur and Nusa Dua. There are so many good surfing spots it’s ultimately up to you to choose where to go. Those who want quieter beaches go east, to Candidasa Beach, or still in the south, Balangan Beach after Jimbaran. Both are not as packed with tourists as Kuta or Seminyak while still having top-notch facilities. Aside from its beaches, Bali is also well-known for its Hindu temples, which are scattered all throughout the island. The reason is that every village is required by law to have at least three temples, and richer communities have more. 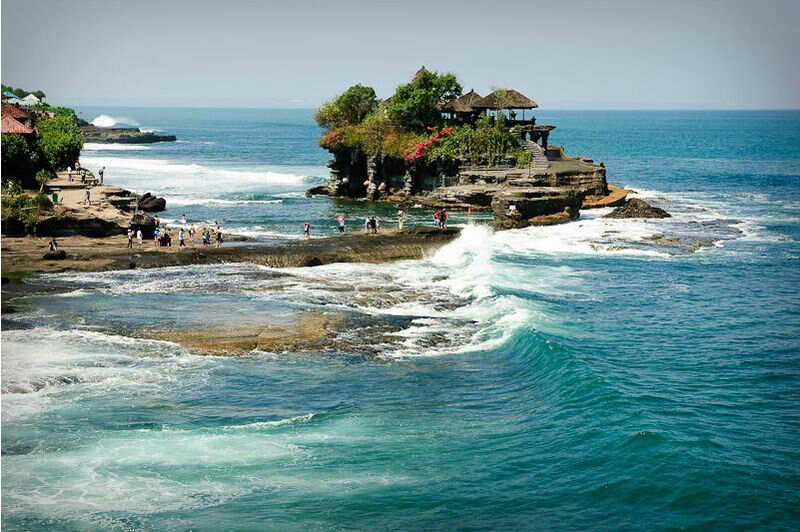 The more popular ones are Uluwatu Temple south of Bali and Tanah Lot in in Tabanan because of the wonderful views. Locals though, see Besakih, the mother temple on Mount Agung, as the most important of all temples on the island. If you wish to enter any temple, remember to be dressed appropriately. A big no-no are shorts and exposed shoulders. If you don’t have a sarong, you can always rent it. The big temples have rentals nearby. 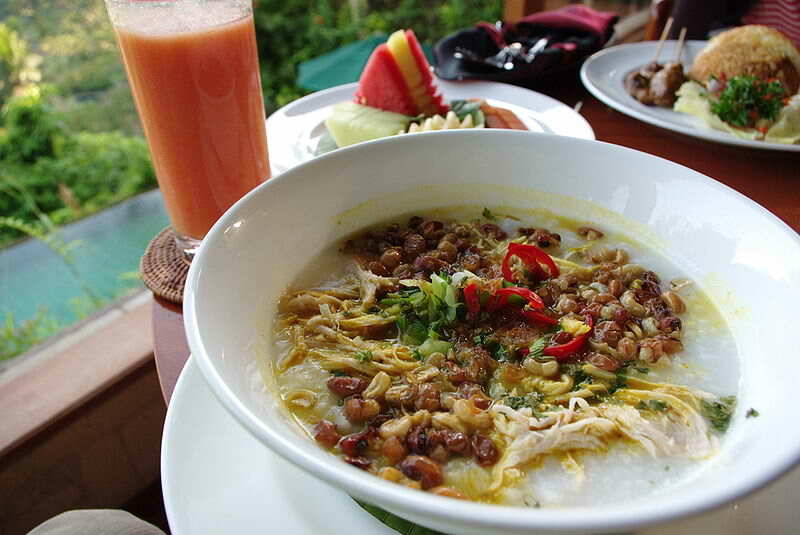 Appreciating the food in Bali is another highlight in this beautiful island. Wherever you end up staying, you have a range of options, from expensive restaurants to the ultra-cheap dishes in warungs, the street stalls you can find everywhere. If you’re not adventurous when it comes to dining, there are American food chains like McDonald’s, KFC, and Pizza Hut. You can even find a Starbucks there! To get the best dining experience, go to the warungs and try their signature nasi goreng (fried rice dish), satay, babi guling (roast suckling pig), or Bakso (ba-so) soup. Aside from getting authentic Balinese food, they’re very cheap too. If you’re not used to spicy food, though, go easy on the spices. It can be really hot! If you have wondered how to become a yoga teacher in Bali, check out Patanjali Institute. We have a unique combination of yoga teacher training and clinical hypnotherapy training program in Bali, in Candidasa Beach near Ubud. If you’re interested, check out our schedule for upcoming classes and availability. There are so many other things you can do in Bali. Like what author Elizabeth Gilbert did (Eat, Pray, Love), you can also seek spiritual renewal here, or go on yoga retreats for your health. Indeed, Bali has something to offer all visitors, it’s just up to you how you make of your time in Bali, the Island of the Gods.